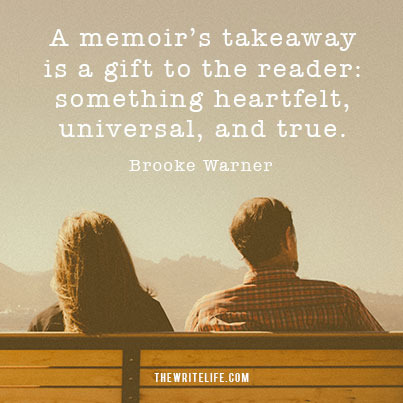 Structure, theme, and takeaway are foundational elements of memoir. When they start writing their memoirs, few writers plan out the work’s structure, let alone the overarching themes and the desired takeaways for the reader. But taking some time to ponder these points before you get too far into your memoir can save you a lot of time — and often many tedious and painful revisions! Here are your blueprints to planning a memoir. Although you’ll hear from memoirists who didn’t use an outline, or who prefer a process over a structured experience, I believe that all memoirists can benefit from having a structure in place before they start writing. Creating a structure for your memoir is not about reinventing the wheel. You can and should base your structure off of memoirs that have already been written. Choosing a beginning point and an endpoint for your story will help you start building your structure. The most straightforward memoirs are those that start at point A and end at point B, moving the reader along in linear time. These include coming-of-age memoirs, like Augusten Burroughs’s Running with Scissors and Julia Scheeres’s Jesus Land , or books that take place over the course of a year, such as Julia Powell’s Julie and Julia: 365 Days, 524 Recipes, 1 Tiny Apartment Kitchen . Then there are framed memoirs, like Cheryl Strayed’s Wild: From Lost to Found on the Pacific Crest Trail , whose narrative is contained over the five-month period of her hike and yet includes liberal flashbacks to her childhood, her upbringing, past relationships, and what brought her to the current timeline of the narrative. There are also thematic memoirs, like Lucy Grealey’s Autobiography of a Face , which spans a twenty-year period and whose timeline is neither linear nor framed, but is clearly focused on a singular issue: deformity and its impact on the author. All memoir should be a slice of your life: don’t try to encompass the entirety of your lived experience since birth or childhood. Memoir is not autobiography, and can be distinguished from its sister genre by its thematic focus. There are countless categories of memoir that point to big-picture themes: addiction and recovery; parenting; travel; cooking; coming-of-age; dysfunctional family; religious experience; death and dying; divorce; and more. Sometimes your category is your theme, but theme is not the same as category. Your theme (or sometimes themes) infuses every chapter you write, and it/they can be quite nuanced. For instance, a theme might be healing through running. What’s important to take into account when you identify your theme is that you must always keep sight of it. I liken this to wearing a pair of tinted glasses. If you put on glasses with purple lenses, you can still see the entirety of the world around you, but you will never forget that you’re wearing the glasses because everything you look at is tinted purple. Thematic memoirs abound, and they typically sell a lot better than other memoirs because they’re what the industry calls “high-concept,” meaning that they’re easy for buyers and readers to wrap their minds around. Addiction memoirs like Tweaked: A Crystal Meth Memoir , by Patrick Moore; Smashed: Story of a Drunken Girlhood , by Koren Zailckas; and Wasted: A Memoir of Anorexia and Bulimia , by Marya Hornbacher are great examples. So are single-destination travel memoirs, or issue-specific books, like Joan Didion’s The Year of Magical Thinking or Laura M. Flynn’s Swallow the Ocean: A Memoir (about life after loss and growing up with an mentally unwell parent, respectively). Takeaway is your gift to the reader. It’s a message, reflection, or truism. Sometimes these fall at the end of scenes or the end of chapters, but that’s not always necessary. Takeaway can happen at any moment, when the author shares something heartfelt, universal, and true. It’s those moments in reading memoir that hit you hard because you can relate — even if you haven’t had the exact experience the author is describing. Understanding takeaway is a long process, and some authors, when they first start thinking about takeaway, make the mistake of being too overt or trying too hard. These are subtle moments of observation about the world around you, a wrapping up of an experience through a lesson learned or the sharing of the way something impacted you. The idea is to sprinkle these moments into your chapters, without overwhelming or spoon-feeding your reader. Takeaway can be found in all good memoir. These are moments of reflection, and speculative prose that drives home a specific experience. Good writers do this so seamlessly you don’t even realize it’s happened, except that you feel like he or she has burst your heart, or crushed you with the weight of their insight. You feel like you know the author because it’s as if she’s speaking directly to you. Good takeaway is in fact mirroring. It’s a way of relaying that we are not alone and the world is a crazy place, isn’t it? But is it such a bad thing to live like this for just a little while? Just for a few months of one’s life, is it so awful to travel through time with no greater ambition than to find the next lovely meal? Or to learn how to speak a language for no higher purpose than that it pleases your ear to hear it? Or to nap in a garden, in a patch of sunlight, in the middle of the day, right next to your favorite foundation? And then to do it again the next day? Of course, no one can live like this forever. Not all reflective passages have to be questions, but you can see that this technique is effective. Gilbert is ruminating over the life she’s living, but which she cannot maintain; in her experience — through the vantage point of her American understanding of the world — it’s not possible, and undoubtedly 99% of her readers agree. We all know what it feels like to be saddled by the burdens of everyday life. Gilbert’s readers would feel this passage on a visceral level, even if they’d never before been to Italy, because everyone understands the longing that’s wrapped up in allowing yourself to just let down. And that’s what makes this a takeaway; it’s a universal connection to the reader. What are some of your favorite memoirs? How did they use these three building blocks? Brooke I’ve learner so much from your posts. I am ready to get down to business and finish my memoir, Out of the Fishbowl – Into the Ocean. That’s my theme and I sprinkle it into my chapters in a way that it’s understood without expounding on it. Thanks for your intelligent and concise teaching on this genre. Thanks so much, Annie. I appreciate the comment and always love to hear it when a memoirist decides they’re ready to give it their all. It’s the only way through. Good luck! Some great tips here – thank you. I recently finished a collaboration with two other authors in creating a workbook to help people get started with their memoirs. It is part of a presentation my writing group give. Mandy, your book looks great! Thank you for writing it. However, when I went to the link and tried to order your book, the postage was $20. I decided not to order it after all. Is there any other place I can order without being charged for so much shipping? I live in Nebraska. Catching up on some long overdue reading before I hit the goals for 2014, and came across this helpful post of yours. Lots of good tips and information here. Evernote, it here it comes! Like your note about “sprinkling these moments into your chapters”. Adding to much at once can be distracting to the reader. But spreading them out can help keep the engaged for the long term. Nice article Brooke! Thank you! I guess you can say, I am A Late Bloomer. 56, vibrant and ready to live life to its fullest. I’ve raised my daughter, she’s grown. I brought my six day old grandson home from the hospital. He’s fifteen going on thirty.! I call him JB, we have a bond beyond grandparent. He was my little miracle. JB, brought something to the table that I needed. I needed to feel love that was missing at the time. Around about the time those same feelings depression creeping up on my soul. That’s what depression, PTSD, came into play.. I first attempted suicide at eight; the first time , I spend a couple nights at my biological parents and siblings house. My emotional well-being; was crushed at age 3. At 3, I met my biological parents for the first time. I remember hearing a loud bang on the window of the back door; located in and accessible to the kitchen. A woman voice shouting help; he has a gun and he’s trying to kill me. Did I mention how early in the morning? Let’s just say it’s pretty early; if the rooster hadn’t crowned. I have no regrets. I’m a Christian and I believe if you wanted bad enough, it’s yours. I believe the truth can set you free, and hurt you too. My goal is to help others heal through therapeutic writing.